The Zombie has been a fascinating character in the contemporary time. Based on this theme, Limbic has developed Zombie Gunship for Android – a three-dimensional thermal imaging display game where a player can experience the adventure of fighting with zombies on the digital gadgets. It has fetched more than 100 thousand installations and an incredible rating of 4.4 out of 5 on the Google Play Store. Zombie Gunship app has secured accolades from multiple gaming rating firms such as IGN and Forbes. 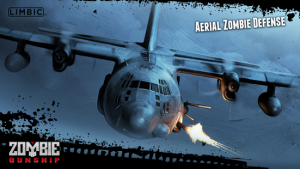 The primary objective of Zombie Gunship Android game is to use the AC-130’s weapons systems to manually target and kill increasing waves of zombies, who are attacking humans running on the ground to the safety of a bunker. The zombies are moving towards the bunker to overrun it. Also, a user need to control the shooting position as killing the threshold number of civilians or letting a zombie into the base, ends the game. The user-interface, graphics, aesthetics and sound are impressive and effective in every game mode. The undead appear as the dark figures trying to make it into the base, while the warm-blooded civilians appear white. Vanishing each zombie results in the coins that can be used to upgrade defense rounds. Besides that, these upgrades grant incentives like faster firing and quicker cool-down for your weapons, as well as other improvements like radar upgrades and extra coins for zombie kills. The app costs mere $0.99 and unveils a platform to experience a real-time play against zombies by obstructing marketing advertisements which is a distracting factor during any game play. The app is compatible with both smartphones and tablets. It requires Android version 2.3.3 or higher. Zombie Gunship brings three types of weapon on the board as 25mm Gatling gun, 40mm Bofors auto-cannon, and 105mm Howitzer cannon. Depending on the weapon – firing rate, speed to target, cooling rate, and damage radius shows significant improvement to aid the user to do well in the game to earn ranks to outpace other players competing for the top leader position. It provides game controller support, so a player can shoot zombies with a gamepad for experiencing the game in a new way. The most appealing feature of the game is its compatibility with Google cloud to save game progress and accessing the same with any gadget at any-time. On the downside, the game contains one map which isn’t a major issue as terrain doesn’t impact the gameplay all that much. Like many of the popular games on the App Store, Zombie Gunship has a simple concept and an addictive upgrade mechanism. Grab this one up for a quick, satisfying blast of fun with zombies.